It's so nice to be back to crafting. It's been months other than a few layouts here and there since I really sat down and played. Today I have a card to share. I pulled out some supplies from my stash while I waited for a small order I placed at Stampin' Up! 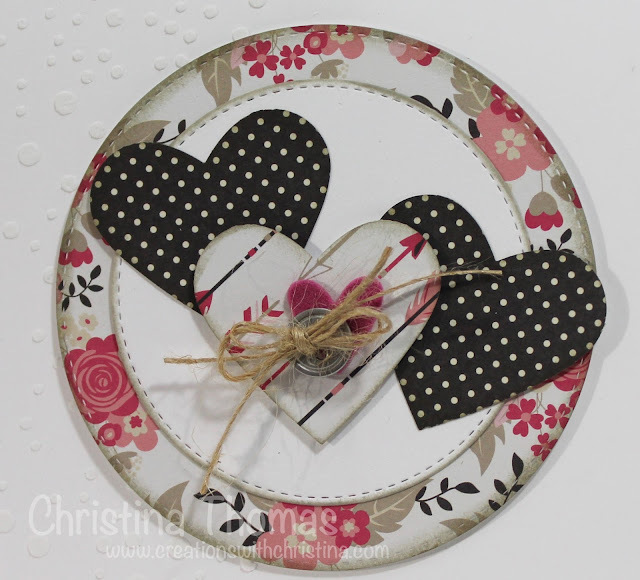 and made a cute 5-1/2" Valentine's Day card. I used Neenah Solar White 80lb cardstock as the base for my card, and stenciled it with white embossing paste to create a dot border on the side. It gave it nice texture and made the simple white background of the card base stand out more. For the main focal point of the card, I used stitched circle dies by MFT and die cut pattern paper by American Crafts and a smaller white circle from the Neenah cardstock. Also from the same pattern paper pack I punched three hearts with coordinating colors and inked the edges with Pumice Stone Distress Ink. To finish it off I added a metal button, a little felt heart I die cut, and some May Arts Twine. 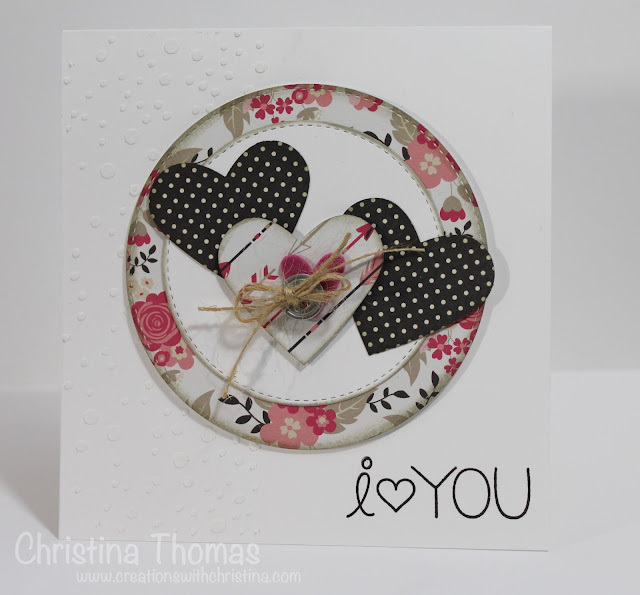 The sentiment is stamped with a MFT stamp set and VersaFine Onyx Ink. What a beautiful card Christina!!! How wonderful to have you back, Christina. You've been missed. Your card is absolutely darling. I'm grabbing my texture paste right now - thank you for reminding me how easily using that stuff makes an impressive background. Yeah, Christina is back. I love your creations and enjoy your videos. 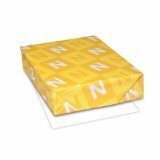 Your Valentine card is stunning. So nice to have you sharing your ideas again! 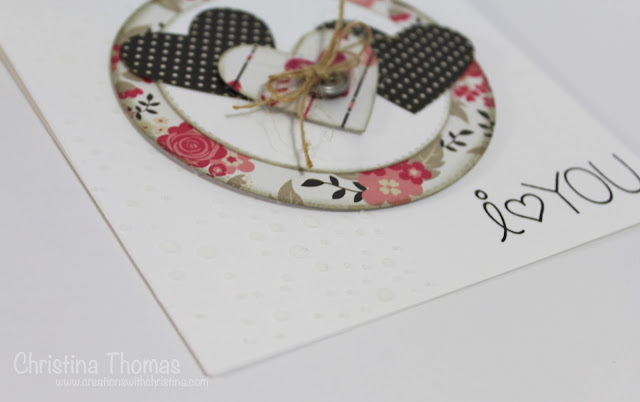 Loved this card, and I need to try out that embossing paste! Love the card! Please show your page layouts. Lots of people still love scrapbooking :) You are so great to share what you do!!! Thank-you so much! Its good to see you post again :) ( happy dance ) . Soo missed your tutorials. They pulled me thru some tough times when I needed inspiration since I got a Cricut for Christmas. You are so good at this and truly make such wonderful cards. Wishing you the best.